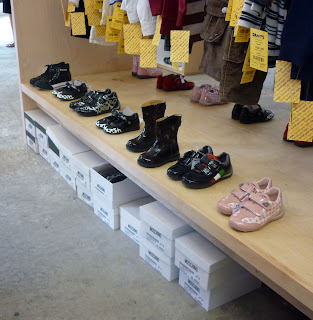 Even amongst all the beautiful European clothes at Daffy's Pop-Up store, now dedicated to the kids, I couldn't resist taking a million shots of baby shoes. Click for up-close cuteness. 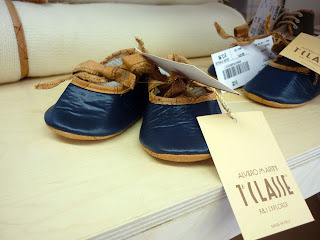 These baby shoes by Alviero Martini are $13.99. 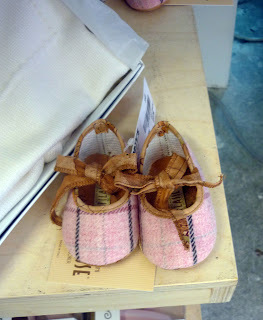 This cute baby stuff is like an illness. 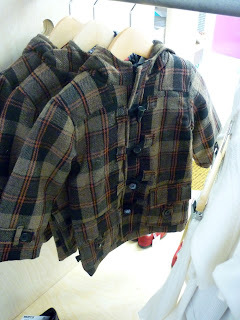 Please feel free to smack me in comments if, post-baby, I begin to gush on and on about baby clothes. Gorgeous Alviero Martini newborn set, $23.99, (reg.$219), Martini newborn cardigan, $19.99, (reg.$180), and Room Seven jacket, $49.99 (reg. $100). 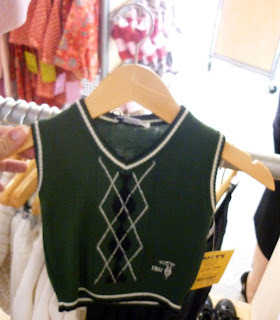 For the little guy: newborn vest by Trussardi, $26.99 (reg. $90), Feu Follet infant coat, $19.99 (reg. 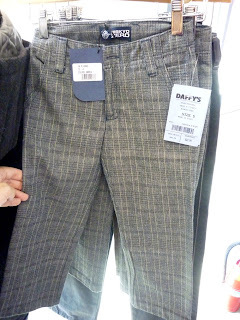 $56), and Riskyo Zero pants, $23.99 (reg. $80). 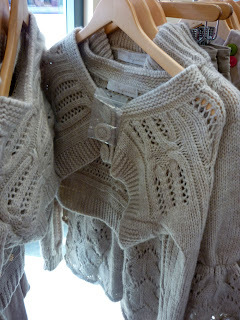 Mommy wants: Burani cardigan, $29.99 (reg. $234), Halabaloo button dress, $29.99 (reg. 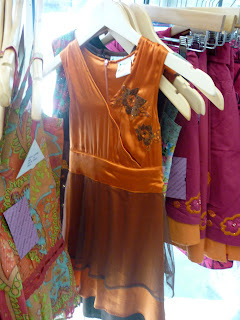 $72), and orange Le Fromage dress, $23.99 (reg. $76). Room Seven stockings, and Moschino shoes and boots. 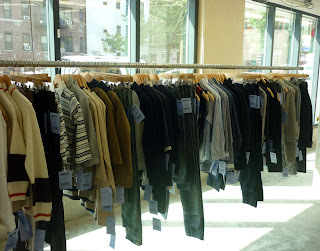 Daffy's Kid's Pop-Up at One Seventh Avenue South is open just in time for back-to-school. Chelsea moms are going to be thrilled with the selection and prices for these clothes. 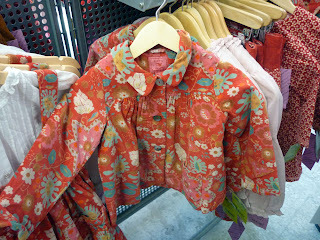 The buy is as well-edited and impressive as the adult pop-up, but not quite as quirky-minded. Instead it's more "elegance defined." Seriously, nobody does understated elegant kid like the Europeans (the Italians are well-represented here). 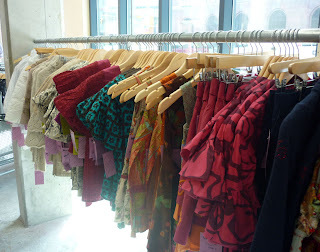 Again, everything in the pop-up can be found at Daffy's Herald Square. Moms, you really have to visit Herald Square for your baby, because I've been dropping by a lot lately to gawk. 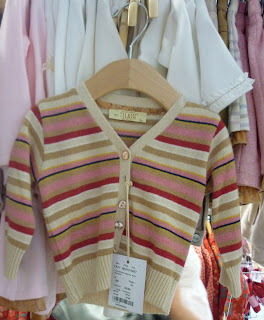 And between the above labels, the bon bebe, and the Small Paul, well, it's really, really cute. 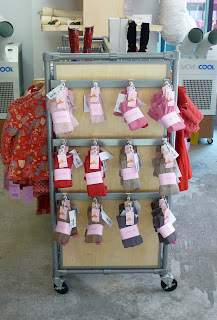 Daffy's Pop-Up for Kids, One Seventh Avenue S. at Carmine St. 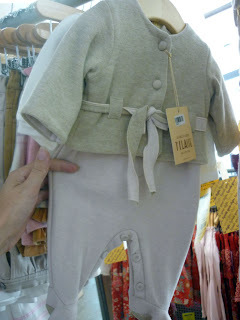 I still find baby clothes cute!! You're going to have a stylish bebe, I know it! Oops! LOL, look how my name came out! I thought there was a WendyB imposter, horrors!